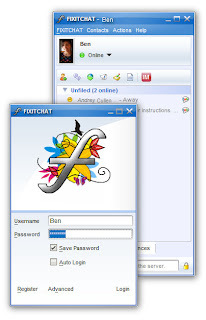 FIXITCHAT is a new multi-procotol instant messaging client for PCs and Mobile Phones. FIXITCHAT currently supports Google Talk, Yahoo! Messenger , MSN, Gadu-Gadu, ICQ, QQ, Live Journal, My Space, Same Time, Facebook, IRC and AIM. # Chat to your friends anytime anyplace 24/7 without interruptions. # Video Call your friends in the comfort of your own home. # Voice Call your friends and family for free. # Add a profile picture.